You can create or open a scene using the Welcome screen. NOTEThe scene name should not exceed 23 characters and cannot contain special characters, such as *&^%!. 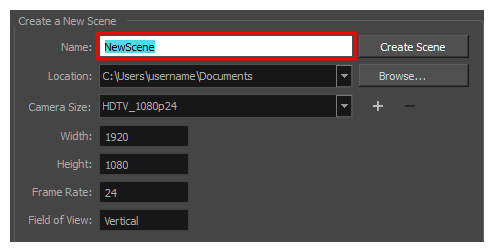 To decide in which directory the scene will be created, click the Browse button next to the Location field. From the Camera Size menu, select a scene resolution.